The College of St. Monica is a medieval and renaissance recreation club at Monash University. 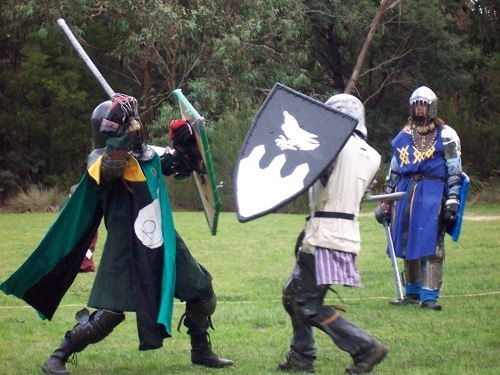 It is affiliated with the Society for Creative Anachronism (SCA), a worldwide medieval reenactment group that started as a backyard costume party and never stopped. The College has strong ties to the Barony of Krae Glas, a branch of the SCA covering the south-east of Melbourne, which derives much of its membership from graduates of Monash University. If you want to find out more about us, join our Yahoo group » and say hello or turn up to one of our weekly activities and see what we do. Members of the SCA have diverse interests, you will be able to find people who can teach you medieval and renaissance costuming, armour making, brewing, cooking, tablet weaving, braiding and other decorative arts, tent and pavilion making and camping in medieval style, music and instrument making, calligraphy and illumination. Check the calendar for notices about upcoming activities, and to find out about other medieval reenactment events near Monash University. (Compatible with Monash’s Google-mail!) This page has calendars for all of the SCA groups in Melbourne. A facebook group has been setup for general chit-chat, project questions and last minute driving directions before attending an event. This is the perfect place to check if you can grab a lift with someone or borrow some feasting gear. This is an open group so please join! Some event notifications will be sent to this group. The yahoo email group is our mail method of disseminating information about upcoming events. General chit-chat is low however all events in Melbourne get posted to this email list. Each group in Melbourne hosts their own email list and some people find it useful to sign up to them all. The Cunnan is a medieval wiki started by alumni of St Monicas. It is a medieval wiki which covers a very broad range of topics. It has SCA leanings. It contains articles from historical battles, research by Peers of the society as well as recipes for medieval foods. A practice bout with sword/shield and great axe.